At Explorer Motorhomes there’s definitely a theme of evolution with its motorhome designs, all of which are based on either Toyota HiLux or Ford Ranger 4WD cab chassis. These are the vehicles of choice for many motorhomers who like to get offroad, but cannot afford bespoke designs of larger vehicles. There are a few practical issues even with HiLux/Ranger-based vehicles. The first is usually a weight limit, i.e., keeping the overall weight within the bounds of the vehicle’s GVM. Another problem for many people is that most of these designs have a transverse bed in the Luton peak above the driver’s cab. A third issue is that, given the vehicle’s limitations, internal space can be a bit tight. 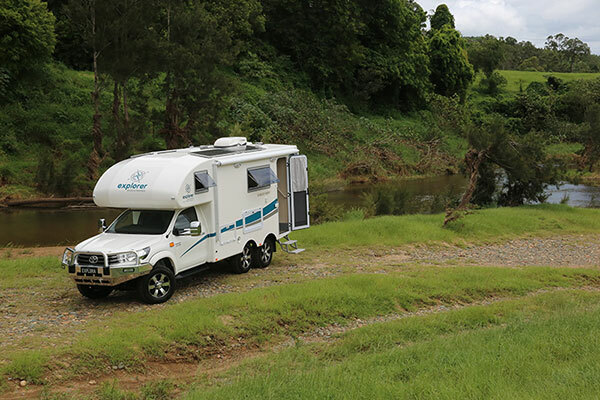 Based in Clontarf, Qld, Explorer Motorhomes has solved the first two issues in recent years by up-rating the base vehicle’s GVM and designing both single and double lengthwise bed configurations above the driver’s cab in both its Vision and Spirit models. A few months ago John Burke, proprietor of Explorer Motorhomes, rolled out its latest model – the Discovery. It has an extensively modified Toyota HiLux chassis that comes with an extra axle at the rear and an up-rated 4495kg GVM, putting it in the same class as Mercedes-Benz, Fiat Ducato and Iveco Daily-based motorhomes. It’s a fully load-sharing system and all the work was done by a Victorian based-company, Multidrive Technology (www.multidrive.com.au). I was given first look at the brand new motorhome which also includes a polished alloy bullbar. It’s impressive, to say the least. Although my review model was a 4WD with a lazy rear axle, the option exists for real enthusiasts to get a 6WD version for an extra $25,000. Although the prime purpose of the extra axle is to give extra load and space capacity, it also changes the driving dynamic a bit. Not in a substantial way but it's better than a four-wheeler, as there’s less of the fore and aft pitching that sometimes occurs with short-wheelbase vehicles. I didn’t get the opportunity to do any hard-core 4WDing driving to find out if the lazy axle affected the rear wheel traction in any way, but for the slippery conditions I was in I didn’t find it much of a problem. However, I’d reckon it’s something to keep in mind. On the road, the Toyota 2.8L turbo-diesel delivered the goods and the six-speed auto responded willingly under all the driving conditions I could find. Clearview rear-view mirrors are fitted as standard and, along with the rear-view camera, work very well. Using the technique honed in both the Vision and Spirit models, the Explorer body is fully moulded fibreglass. A one-piece moulding offers the advantages of a good strength to weight ratio, as well as a seamless body, thus minimising water leaks. A benefit of not using any framework is that since all the internal cabinetry is screwed, bonded or fibreglassed to the main shell, there are no restrictions on where it might be placed. Windows are Dometic/Seitz acrylics and the Camec door has a separate Crimsafe security screen. In keeping with most ute-based motorhomes, the external bin capacity is a bit limited with just one at the left-hand side of the rear wall. It should contain most of the external camping essentials – hoses, power leads and the like. It could also be used for a generator. One of the reasons there isn’t a second bin is that space is taken by the slide-out barbecue located on the mid nearside wall. There are, of course, the other essential bins for gas (two 4kg gas cylinders) and toilet cassette, complete with SOG ventilation system. Camp chairs and a table will be a bit tricky to store, but I always find the shower cubicle is a reasonable alternative when on the road and the driver’s cab when you are parked up. 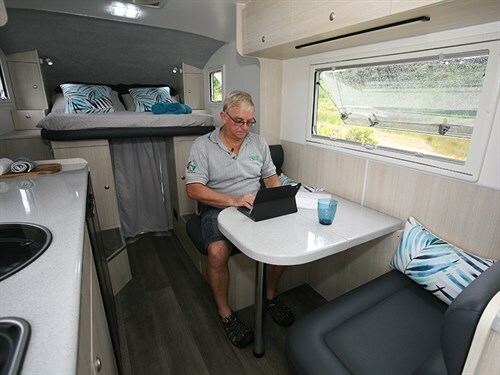 Those who design RV interiors will tell you that it’s surprising just how much 150mm/6in extra width or length makes to a motorhome or caravan interior. So when you add just over 1m (4ft) (compared to the Spirit/Vision models), it’s like ‘manna from Heaven’ to both designer and users. 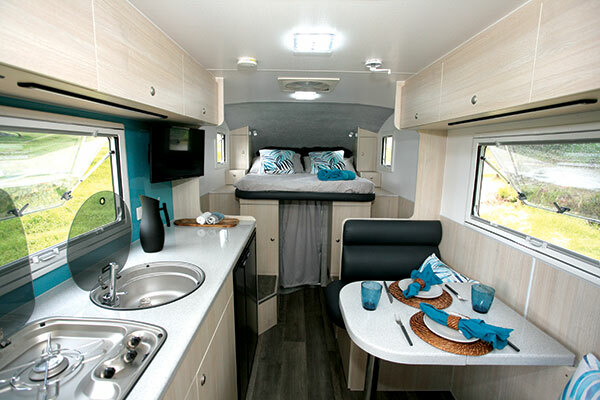 What we end up with is not unlike many caravan layouts, with a lengthways double bed up front, a full bathroom at the rear, and both the kitchen and dinette in the middle. Even in a relatively confined space a generous window area adds both natural light, ventilation and a good space perception. Up front, the double bed has been set off the floor to fit above the driver’s cab, but there are steps on either side for easy access. This is no flat floor motorhome, but there is limited cab access for emergencies and, to that end, the bed based can be lifted up on gas struts. Fully extended, the bed reaches 1.9m (6ft 3in). Part of the bedroom area fit-out includes small bedside cupboards and drawers, cabinets under the bed, and storage compartments under the steps. Discreetly hidden in one of them is a small safe. It’s all quite a clever design and a very effective use of space – nothing wasted. Windows on either side and 12V Sirocco fans fitted to the overhead lockers ensure good air circulation in warmer weather. Fridges might seem a bit of an odd place to start a kitchen comment, but this one is interesting for the most part from a size point of view. RV fridges in Australia seem to come in two styles – under-bench and sized less than 100L, and anything over that which requires a much taller cabinet. The gain for a smaller fridge is more kitchen bench space or a kitchen that takes up less space. What Explorer has fitted into the nearside kitchen bench is a 200L Isotherm compressor fridge. It’s a two-door unit that fits (ta dah!) under the bench. I’ve also seen a few other variations on the theme in Euro-built motorhomes in New Zealand, but not here in Australia. That two-door fridge then allows for a three-burner cooker, round stainless steel sink and a generous amount of benchtop area. In addition to that, you still get a cupboard with wire basket drawers and slide-out, two shelves, and a microwave between the shelves. There are also three overhead lockers but one, handily located by the habitation door, contains the electrical essentials. Opposite the kitchen bench, the cafe-style dinette will seat two people without too much trouble. The large adjoining window gives a good view of the surrounding countryside – a dry view in my case because it was raining heavily at the time! The table is a bi-fold unit, but it doesn’t operate in the conventional way. It has a fold, but the folded section is designed to slide down a slot on the wall, not fold back onto itself. It simplifies the table mounting but requires two hands to lift the table in and out. Like a few other features in the Discovery, the bathroom is slightly different. Yes, it has a shower cubicle, cassette toilet, and washbasin all set around the rear offside corner. Logic might suggest the shower door cubicle faces the side, but it actually faces the rear. That integrates with the overall corner layout and means the bathroom can be closed off by the sliding door when in use – actually it has to be to get to the shower cubicle. The layout made it very tricky to get a decent bathroom photo but, more practically, it did seem to be a workable arrangement. In the rear corner, the cabinetry is devoted to both a small wardrobe and cupboard space with shelves. The lower half being for the external bin. Overall, I’d have to say the internal storage scores quite well. You would expect a motorhome designed for offroad travel to be well equipped for that purpose and the Discovery delivers. It offers 150L of fresh water capacity as well as 55L of grey water. Electrically, three 105Ah deep cycle batteries are charged up by four 1.15kW solar panels and, of course, both the mains and vehicle chargers. As I noted in my opening comments, it’s hard not to be impressed by Explorer’s Discovery, both inside and out. Just how much interior space is added by fitting the extra axle is quite amazing, and I gathered from their comments the Explorer design team were surprised, too. Of course the price jumps somewhat from the more conventional four wheelers, but then this is a rig designed for serious and sustained offroad travel. An advantage it has over larger cab chassis-based vehicles is the width is better for tight corners and narrow bush tracks, whilst still providing a decent internal living space.